The paper shredding and obsolete electronics pick up scheduled for today has been cancelled due to weather. More information to come later about rescheduling the event. The University will begin a modified summer schedule on May 9 through August 8. Business hours for the campus will be adjusted during this period to 8:00 a.m. to 4:30 p.m. As always, the area supervisor is responsible for the scheduling decisions that will best meet the University’s and their respective department’s service requirements. We will return to regular hours on Monday, August 8. The modified summer work schedule is incumbent on ensuring coverage to service our many constituencies. It is important to maintain our commitment and communication with students and their parents during the summer months. Your assistance in this regard is greatly appreciated. Participants in the Ride for World Health 2016 cross-country bicycling journey to raise awareness of global health issues will be speaking today from 3:00-4:00 p.m. in Room 334 in Graves Hall. Please check out their website here and join them for their presentation! GAP and Changemaker end-of-year potluck picnic! Come enjoy a potluck picnic with the Institute for Global Enterprise on Thursday, May 5, from noon– 1:30 p.m. at the Buffalo Trace Council Eykamp Scout Center off the Lloyd Expressway. (The address is 3501 East Lloyd Expressway.) Everyone is welcome and encouraged to bring a yummy dish and/or outdoor game! Drinks will be provided, and the main lounge inside is reserved in case of bad weather. No RSVP required. All GAP and Changemaker students and alumni, coaches, judges, and UE faculty and staff are warmly welcomed. It’s been a great year for both programs, and we hope you’ll help us celebrate! If you would like to bring a dish, e-mail Erin Lewis (el131@evansville.edu) what you’ll bring so we can keep rough track of what’s needed. Get your yoga on! Learn Buddhist chanting! Experience Islamic prayers, learn more about the Christian tradition! 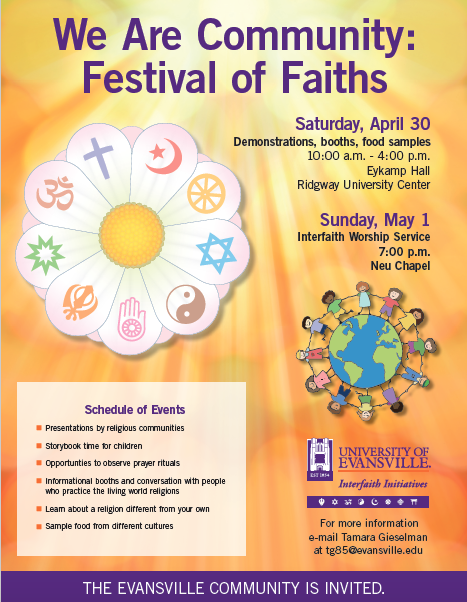 The Evansville community is invited to experience the Festival of Faiths in three phases this weekend, April 30-May 1 in Eykamp Hall, Ridgway University Center; and Neu Chapel. Phase I: Saturday, April 30, 10:00 a.m.-4:00 p.m. Eykamp Hall and the second floor of Ridgway University Center will host informational booths, cuisine samplings, prayer and worship demonstrations, adult and kids’ yoga, story-time and craft-time for kids, and much more! Detailed schedule of events can be found by clicking the Facebook page link below. Phase II: Sunday, May 1 at 5:00-6:15 p.m. in Eykamp Hall, Ridgway University Center - Join Omar Atia and David Hayden for a 1:1 straightforward discussion about Islam, Jihad, and their relationship with terrorism. University chaplain Tamara Gieselman will serve as moderator. Omar Atia serves as imam at the Islamic Center of Evansville and David Hayden is a retired English teacher from Memorial High School in Evansville, Indiana. Phase III: Sunday, May 1, 7:00 p.m., in Neu Chapel - Join the Evansville interfaith community for an inclusive service of prayers and reflections as we bring the Festival of Faiths to a close and approach the National Day of Prayer. The service will last about one hour. All are welcome. For more information, check out our Facebook event pages. Please join the School of Education at a farewell reception for Paul Parkison, associate professor and chair of the School of Education, today from 3:30-5:30 p.m. Paul has served the University for the past three years. We wish to thank him for his service and recognize his many accomplishments. The reception will be held in Room 240 in Graves Hall. Please stop by and wish Paul well. The Harlaxton Society is sponsoring a reception for Harlaxton faculty and administrators visiting the University of Evansville Spring Commencement. Everyone is invited on Friday, May 6, from 2:00-4:00 p.m. in Dunigan Lounge in the Schroeder School of Business Building. Please join us in welcoming Amber Pouliot, Edward Bujak, Jerry Seaman, and Patricia Vilches. UE's all-female a capella group, Ladies in Pink, and the all-male a capella group, Trebles Without a Cause, will join together for their end-of-the-semester concert. Come join us for the fun on April 30 at 3:00 p.m. in Shanklin Theatre! Any current student needing their official transcript must submit an order no later than 5:00 p.m. on Wednesday, April 27. Orders placed after this time will not be processed until Tuesday, May 10. No exceptions! You can place your order through: www.getmytranscript.com. If you have any questions, please contact the Office of the Registrar. Fifteen high school students from North, Central, and Harrison visited UE on April 19. Heidi Strobel, associate professor of art history, helped them prepare for their upcoming AP art history exam. James MacLeod, professor of history, and Alan Kaiser, professor of archaeology, spoke to the students about their recent publications, Evansville in World War II and Archaeology, Sexism, and Scandal: The Long-Suppressed Story of One Woman's Discoveries and the Man Who Stole Credit for Them. As part of a belated celebration of Earth Day, the flagstone path leading to the Peters-Margedant House was dug up on Sunday, April 24, and stored in preparation for the house’s move to campus. Associate professor of art history Heidi Strobel, chair of the creative writing department Paul Bone, community activist Jim Renne, architect Adam Green, Signature High School student and Browning-Miller intern Bridget Gismondi, members of UE’s Society of Archaeology and the History of Art, as well as members of the Sigma Phi Epsilon fraternity participated in this earth-moving event. Architect William Wesley Peters, who attended Evansville College in the late 1920s, designed the Peters-Margedant House in 1934 for a family member. He did this while on hiatus from his work as architect Frank Lloyd Wright’s chief apprentice. The Peters-Margedant House, a very early example of Usonian architecture, is currently located at 1506 East Indiana Avenue. 2016-17 financial aid award information will be available in mid-June once satisfactory academic progress (SAP) is reviewed at the conclusion of the spring semester. Monitor your financial aid information including checklist items and missing information through the Financial Aid Self-Service link in WebAdvisor. Please review these items for further details. Throughout the summer, continue to check your UE e-mail and Financial Aid Self-Service for notifications or requirements regarding your 2016-17 financial aid. If you’re planning to file the 2016-17 Free Application for federal student aid (FAFSA) (fafsa.ed.gov), please do so by June 1 in order to receive a comprehensive financial aid award. If you have any questions, please contact the Office of Financial Aid. Wednesday, April 27 - Friday, April 29: 8:00 a.m.-7:00 p.m.
Saturday, April 30 - Sunday, May 1: 11:30 a.m.-5:30 p.m.
Monday, May 2 - Friday, May 6: 8:00 a.m.-7:00 p.m.
University of Evansville’s ASCE Student Chapter has been selected by the Committee on Student Members to receive the Certificate of Commendation for its outstanding activities as recorded in the 2015 Chapter Annual Report. This is a distinction earned by only the top 5% of all student organizations. ASCE has more than 350 student chapters from all across the world. Our ASCE student chapter participated in a variety of activities, from community service projects and professional meetings to social events. Stuart Watson (president), Alejandro Mojica Cadario (vice president), Jaclyn Altstadt (secretary), and Hannah Kirk (historian) served as chapter officers in 2015. Immanuel Selvaraj and James Allen, associate professors of civil engineering, serve as the faculty advisors. Please join the creative writing faculty in congratulating senior Joy Grace Chen on winning the Norton Writer's Prize, a national competition that is awarded annually for an outstanding essay written by an undergraduate. Chen's essay Fermentation took first place, and the judges admired her "use of form, tone, attention to sensory language, dialogue, and pacing." One judge wrote, “Each vignette adds to the author’s ability to finally see the truth of her parents’ world—and her own truth—for what they are.” This is an incredibly competitive award, which comes with a cash prize, publication, and serious bragging rights. Way to go, Joy Grace! Senior Rick Voyvodic and sophomore Tyler Gray came home in the top ten as the University of Evansville Men’s Golf team took sixth place at the Missouri Valley Conference Championship on Tuesday at Prairie Dunes Country Club. The impressive effort by the Aces saw their success in the conference championship continue. UE has finished in the top 6 in the tournament every year since 2008. Voyvodic capped off the tournament with an even 70 in the final round. His efforts saw him finish in fourth place with a 217, just seven over par over the course of three rounds of action. His scores on Monday were a 75 and 72. He finished just six shots behind the winner. It marked the best finish for UE since Andrew Luo finished second in 2012. He was also named to the All-Conference Team. With the honor, he became just the seventh place in program history to garner the honor. Tyler Gray also had a strong tournament, tying for ninth place. He followed up Monday’s efforts of 76 and 72 with a 4-over 74 to finish with a 222. Third on the team was Will Knights. He came home in thirty-first with a score of 232. Next up was Wil Pahud. He carded an 80 in the final round and completed the tournament with a 235. Joseph Addante rounded out the squad with a 242, tying for forty-first. UE bested Drake on Tuesday by one stroke in a battle for sixth place. The Aces notched a 906 while the Bulldogs finished seventh with 907 shots. Bradley came in fifth place with a 903. Southern Illinois took top team honors as they defeated Wichita State by ten strokes. The Salukis finished with 877 strokes, defeating the Shockers by ten. Trent Wallace of Illinois State was the medalist. His winning score checked in at a 1-over 211. He defeated WSU’s Grant Bennett by two strokes. University of Evansville Women’s Tennis junior Andjela Brguljan has been named Academic All-Conference Honorable Mention. Brguljan has been a cornerstone for the tennis team on and off the court. Through the years she has been a paramount figure on the court, playing consistently through the line-up. This year she has spent time at flight one, two, three, and four singles compiling an overall record of 7-12. Brguljan also has a record of 10-10 in doubles play while playing with several different teammates as a partner throughout the season. She has gone 6-6 in dual matches and went 1-6 in tournament play this past fall. Brguljan is a premier student in the classroom as well with her GPA currently sitting at a 3.698 as a business management major. Twenty-nine student-athletes were nominated for the Valley’s scholar-athlete team. The criterion for the honor parallels the CoSIDA (College Sports Information Directors of America) standards for Academic All-America voting. Nominees must have participated in at least 75 percent of the regular-season matches or be projected to play in the MVC Championship, with at least a 3.20 cumulative GPA (on a 4.00 scale). Student-athletes must have reached sophomore status in both athletic and academic standing at their institution (true freshmen, redshirt freshmen and first-year transfers were not eligible).